It all starts Saturday, July 11th at Gopher Dunes in Courtland, Ontario. This year’s crop of women racers ready to contest the Women’s East Nationals looks very impressive. It’s always nice to have the reigning champion line up with the big #1 on their back. This season, that champion is Quebec’s Eve Brodeur. Eve was only really challenged by one racer last season, and that was former champion Jacqueline Ross. ‘J-Ro’ only made one round, but that one round showed everyone that Ross had not lost anything while she was away from the sport. We know for sure that Brodeur is back and has stepped up her game big-time. The young French rider is fast, fit, and smart beyond her years. The questions going into round 1 are…Where’s J-Ro? Is she coming back? And if there is no J-Ro, can anyone else run the pace of the champ? This is motocross and anything can happen, like we saw earlier this season when ‘odds on favourite’ in the west, Kennedy Lutz, pulled out of the series only days before the final round with injury. There are plenty of capable racers standing in the wings ready to strike if anything should happen like in the west. I really feel that our top 3 in the series could all be from Quebec. I was amazed with how many talented ladies that province has. I feel that young Kim Normandin will be very dangerous in the sand, and veteran Cassandra Belanger‘s fitness and heart will make her a podium threat every moto. MX101’s Allie Argue will be fired up to lose quite a few digits from her #8 by season’s end. As always, we will have a very fast group of Americans led by #3 Abrielle Tardelli, #10 Madi Seguin, and the #92 of Nikki Voorhees. All 3 of these ladies will be running up front all series long looking for podiums. All in all, we are in store for a fantastic East series. But none of this could happen without the endless hours from co-organizers Sylvain Brodeur and Leah Clarke. They have a great group of sponsors and people behind them and it will show come July 11th. I reached out to the Top 10 of the 2014 series and asked each lady about their off-season, pre-season and their thoughts. Thanks for reading and we will see you at the Dunes! My off-season went well, no injuries. I’ve been focusing on school and basketball. Over the spring, I ran track for my school and the last 3 months I’ve been running the WMX series for US. I’m looking forward to the 3 races this year hoping for good results! I would not be where I am today without my mom and dad, my grandparents and my friends! Looking for a great season in 2015. Alyson will not be competing due to a broken wrist. During the off season, I trained with my trainer Rob to keep my fitness up. I enjoyed going snowmobiling and catching up with friends that I don’t see in the summer due to racing. Unfortunately, I couldn’t go down south during the winter due to my dad’s job, so I was stuck here in the cold. During my pre-season, I ended up going to JWTF at the end of April. I won this trip at a prize table for being a part of the women’s nationals. I had a lot of fun training and riding. That was the first time I had the opportunity to ride before the snow was all gone. In the spring months I have been working hard at Sand Del Lee on my fitness and speed, as well as doing as many local races as possible. My goal this year is definitely to win, but I would be satisfied with a top 3 number at the end of it all. [There are] so many fast girls this year, anything could happen. My English is not very good. I’m semi-retired because I’m self-construction of my house. I rode yesterday (June 25th) for the first time of the year with my old KX125 2007 just to have fun! Thanks. This winter I was in school, worked and two days by week I went to Crossfit. At home, I was doing spinning after school. Soon as I could, I was going riding at my home track until the first race begin. I have worked a lot on ruts and be able to do twenty minutes on a rough track (like Gopher Dunes). Between the days I didn’t ride, I [went] cycling to keep in shape. The races are good. I’m still racing with the boys (Junior class) to push myself more and to keep more time on the track. In women class there’s nobody so I can’t compare myself to other girls. Probably for my last women National, my goals are: first, being proud of me, second, have some fun, third, doing a solid top 5 and try to put all the chance on my side. My name is Alexandra Raymond. I raced in the SCMX Snocross Series this winter. Due to my job, it was impossible for me to go train in Florida this year. I decided to keep in shape by doing Snocross races, which made me discover a new sport. The beginning of my season went really well as I competed in a few provincial races to get back in the beat and get ready for the nationals. I worked really hard both on and outside the track. I currently have the number plate 5 and this year my goal is to get even better results. Cassandra Belanger, 25 from Montreal. This year will be very exciting on the East series since many girls have been training hard and got a lot faster taking this game to the next level. Unfortunately for me, I didn’t have the chance to head down south and train so the first couple weeks back on the bike were a little rough although I’m very confident that I’ll get it back in time for Gopher. Podium is only what I’m there for every round. I wish a good and safe season to all of us! I want to pre-thank everyone for making this season possible starting with my boyfriend Kenny Spracklin who is the best AT / Performance specialist / Trainer / Friend I know that is helping, supporting and putting up with me everyday. All my other sponsors are as important: Spracklin Performance, Terra Nutrition, PLX Sport, Oakley, Devinci, Stingray Digital, Cycle Technique, Sprott, Troy Lee Design, Kutvek America, Forma boots, KB5 suspension, Sanctuary Clothing, Espace Santé Lucie Blouin. In the off-season, I attend school full-time and also play collegiate hockey, so unfortunately I am unable to travel down south or race any winter series races. However, I do dry-land training all year round to keep my body as in shape as I can. In the pre-season, I have not been racing as much as I usually do, but as the first round of the Nationals gets closer I have been racing most weekends and hitting up the practice track a few times a week. I’m also at the gym almost every day and cycling often. My goal for the series is to have an overall finish that is better than last season, so it will not be easy but I am determined be more consistent and hopefully get the results I need to accomplish this. I love this series and I appreciate all the hard work that’s put into it. I can’t wait to be back! This summer I will not be racing the series. Last year after Deschambault I had knee surgery that hindered my ability to continue training so I turned my focus to finishing college. I am unsure at this point if I will be back in the future to race. I wish all the ladies racing this year the best of luck. This year, we decided to do things a little differently. We went to do a WMX race in North Carolina in October and left the camper at JWTF for the winter. It allowed us to do a couple of back and forth trips and I spent a total of 5 weeks training with Jimmy (Weinert). I also put in some good work at the gym to get the strength I needed to be able to hold on to my KTM 250SX better and have more stamina for those long Pro-AM races here in Quebec, since I moved up to the Intermediate class. In the pre-season, I did a couple of races in the North East US and in Ontario before the Québec series started. My goals for this summer are to keep my Eastern Canadian title. I would also be seeking redemption at Walton after all the bad luck I had last year. We put a lot of effort in the off-season and I really look forward this summer. I can’t wait for the Eastern Canadian Women’s Championship to start! If we compare to the Western Championship it’s usually easier to see who’s going to be the top contended girls, because they have already been racing 2 months. After seeing Eve Brodeur racing against the guys and dominating every Ladies class she entered, I’m pretty sure no other girls can touch her. I somehow wish an American girl is going to show up last-minute to at least make a good show with her in front, but even in the states I don’t know many girls that would be up to her speed right now. I also hope Kennedy (Lutz) is going to be back for Walton. I saw her ride in Kamloops and she could for sure be battling with Eve on an hard-pack tracks. Other than that, I know Abbrielle Tardelli is coming back with her #3, as well as Cassandra Belanger #4 and Allie Argue #8. Those three girls will for sure make some good battles with Kim Normandin #6 and Abby Davignon #2 if they are coming to all the rounds (which I’m not sure yet). I haven’t heard about Alexandra Raymond and Alyson Bilodeau since last year, so hopefully they’re going to surprise us at the first round but I haven’t seen them at any races so far in 2015. We can also add all the Gopher Dunes area girls that from what I saw from the couple first races are similar speed to each other and that are fast in deep sand (Kassie Boone / Breanna Rose / Shandell Przybilla (if she can fix her shoulder by then)). I’m happy to see that out of the top 10 at least 6 to 7 girls are coming back this year. Hopefully, we can achieve what I saw in Calgary (39 ladies on the gate) or even more. If I find the time and the Team can find a place for my bike in the Semi (Steph (LeBlanc) just confirmed he had enough space for me), I will participate in all three rounds and hopefully finally make at least 1 point after 3 years! I’m really pumped to see the good work Sylvain and Leah put together for the series. I’m happy to show up with the KTM Contingency cheques as well and to see how many sponsors decided to step in this year again!! Good Luck to all the Eastern girls and see you at the races! I have to admit, I haven’t been following the women’s series as close as I would have liked to the past year or two due to my pregnancy and now being a new mom. 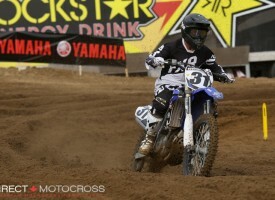 I did get to watch a few women’s national motos out west earlier this year though and man, the top girls are flying! It’s obvious that the speed and talent of the women’s class has come a long way since I last raced! I actually just got back on a bike for the first time since having the baby this past week and I quickly realized how out of shape and rusty I am. I had originally intended on getting enough seat time to race the Gopher Dunes women’s national but now I’m not so sure that’s going to happen. Priorities have changed a bit these days so it’s hard to find time to practice between looking after a 7-month-old baby and trying to support Colt with his racing career. Regardless, I’ll be there cheering on all the ladies! As for my East predictions, I’m not entirely sure who’s all lining up for the full series as I’ve heard J-Ro might be coming back up. If so, I think it will be Eve Brodeur and Jacqueline Ross battling it out for wins each weekend. Eve is young, dedicated, and rides a 250 two-stroke so you can guarantee she’ll get good starts and be at the front every moto. There are also a ton of other fast ladies who had strong rides in 2014 and will no doubt be battling for top five numbers throughout the series including Davignon, Argue, Tardelli, Belanger, Seguin, and Raymond. As for a surprise, I think Kassie Boone has one of the best riding styles of any female rider but for some reason she never seems to get the results you would expect, whether it be due to a crash or not participating in the full series. With that said, if Kassie can improve her corner speed a bit, keep it on two wheels, and run the full series, I think she would be a podium threat every moto and possibly battle for some wins. My most improved pick has to be Honda Red Rider, Breanna Rose. I remember riding local TVR races against Breanna back in the day when she was on little bikes and it’s amazing how much she has improved over the past couple years. This girl has so much fun riding her dirt bike and a ton of passion for the sport so I think (and hope) this will be a good year for her! After seeing such great turnouts at the western rounds, I really hope the Eastern series will attract lots of ladies and be just as successful as the west. I know there are tons of girls who ride in Ontario and Quebec so there is definitely potential for a full gate, it’s just a matter of whether they all show up! I’d also like to give a quick shout out to Denaye Arnett and Camille Baker for keeping the Canadian Women’s National series alive and thriving the past few years. It takes a lot of time and effort to organize the series and line up sponsors so those girls deserve some serious recognition for what they’ve done!